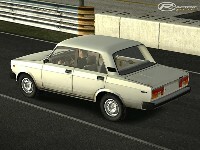 This mod will contain Lada 2104 and 2105. We work on brake lights and We remove problem with compatibleness 2104 and 2105. Styvn goes to Spain for one year. The 3D graphics inside will make by Charlee. We are discussion with Movie recording studio for recording sounds Lada, rigth now. Remember that cockpit is not included and the sound is from other car because new sound was never completed. If you can't be bothered to finish it, why you start it?